Today they submitted their essays. They will go up against some stiff competition. The judges expect over 90,000 essays. We are proud of them for taking the initiative and writing some great essays. Today, we share Meg’s. Stay tuned for Joshua’s tomorrow. Enjoy her interpretation of the untold life of her dog, Zoe. Ever wonder what our pets do when we are working on homework or playing at a friend’s house or totally ignoring them? Well, here is what I think. Hello, I am Zoe. I am Megan’s Boxer dog. I just finished chasing the cat. Oh, those horrid animals. They are always sticking their claws in your face. Horrible, right? Anyway, off the subject of cats. They give me shivers just thinking about them. But, my favourite pastime is breaking out of my fence and going to play with my friends until I get caught. Sounds fun, right? Well. I also LOVE chasing squirrels and frogs. The frogs are really easy because there is a MASSIVE pond in the back garden!!!!!!!!!! Be right back. STICK IN THE GARDEN!!!!!!! Ok, I am back; THAT STICK WAS HUGE!! Well, what was I talking about? Oh, right, big juicy steak bones. Mmmmm. Makes me drool. Yummy! And I LOVE leftovers fresh off the floor. (Sorry if I am grossing you out, whoever is reading this) I will go get a snack really quickly. All this thinking about bones and leftovers is making me hungry. Ok, I am back. My favourite colour is pink, by the way. Well, I better go… WOW! LOOK AT THE SIZE OF THAT SQUIRREL!!!!! And that is what I think our dogs do when we are not around. Zoe: The subject of Meg’s story. I would pick your story as the winner. Boxers are the best dogs, and yes, they are always thinking. Zoe is beautiful!!!! 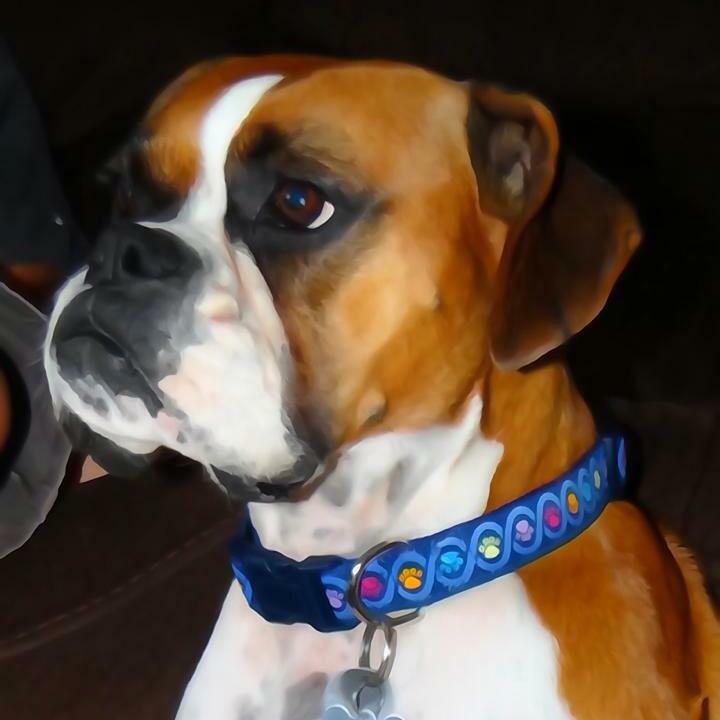 Check out my boxer Maggie on Facebook. I hope the two can meet when you return home to the USA.